The book for discussion is The Happiness Project by Gretchen Rubin. 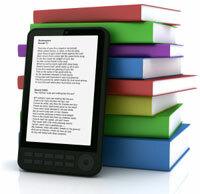 Books are available at the library or as an e-book or audiobook on line. Ask the Librarian how to get your book. 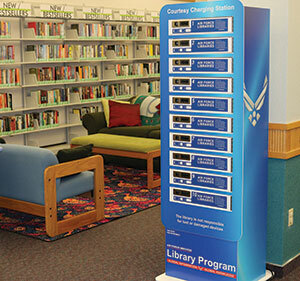 Need your phone, tablet, laptop or other electronic device charged up quickly?—Then come to the Library for the new Charging Station by Kwikboost. It is fast, free and secure. There are 10 locking charging compartments secured by your own personal code. Use it while you use the library’s computers or other resources—OR drop it off and come back later (must be within library hours). Check out the e-book databases: EBSCO eBooks, Gale ebooks, One Click Digital, Safari Books and TumbleBooks Cloud for kids & teens. There are also a variety of eAudiobook databases: AudioCloud, EBSCO eAudio and TumbleBooks for beginner readers. There are more than 100 online resources FREE to you. We have dozens of educational databases including Gale Resources for students, along with the DoD Peterson’s Education Center for practice tests, scholarship and college information and the new COMEX Streaming Video CLEP study guides. Other databases available: Morning Star Investment, National Geographic Online, EBSCO Small Engine Repair, Gale Chilton Auto Repair and more. Ask any library staff member how to go electronic today! Get the access information at the library. For more information or assistance with any online service, please call the base library at 731-4738. 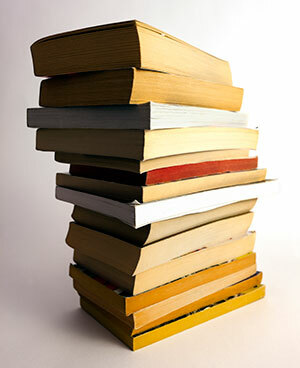 Have a paperback or magazine you have read, but no longer want? OR need a magazine or book to take with you traveling? OR looking for an interesting read? Then bring it to the Library and exchange it for a new one. You can bring one & take one, or bring some and don’t take, OR take some and don’t bring. The Library has an Exchange for children, teen and adult books, magazines and road maps. Sign up for your free HeadsUP! E-Newsletter! Stay in the know with this weekly update of Malmstrom AFB events, delivered right to your inbox. What are you waiting for? External Links The appearance of hyperlinks does not constitute endorsement by the U.S. Air Force of the information, products, or services contained therein. For other than authorized activities such as military exchanges and morale, welfare and recreation sites, the U.S. Air Force does not exercise any editorial control over the information you may find at these locations. Such links provided are consistent with the stated purpose of this DOD Web site.